Think big! 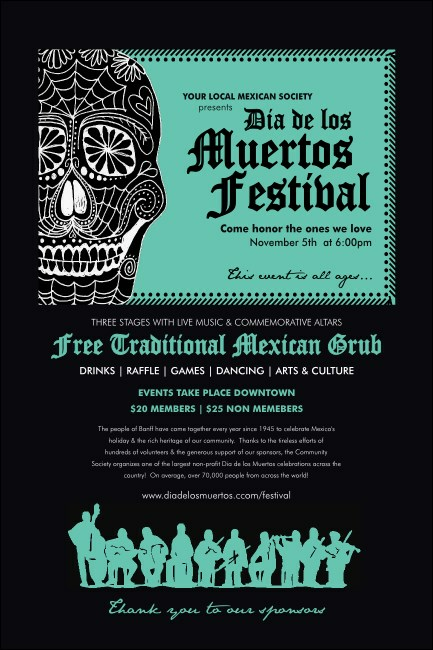 Every region puts its own spin on the Dia de los Muertos celebration. While you're reflecting on the past, present, and future, ensure that everyone joins you by spreading the word of your upcoming event with these big, green and black Day of the Dead Posters, featuring twenty lines of text for your event details on this template. TicketPrinting.com helps you draw a crowd with the right Poster!